Ladies! Welcome to Casa MWS! Now while we wait for the tea to be brewed and poured into the Wedgwood gold edged bone china tea cups, I’ll tell you about the newest most expensive luxury skincare cream. Ever. James (thats our butler) will bring around the new Kanebo Impress Granmula skincare range, comprising the Lotion, Emulsion and Cream which target lines and uneven skintone i.e. anti-aging and whitening/brightening concerns. I tested the sample sizes which lasted me about 3 weeks and I don’t know whats in those plain glass bottles, but damn! its good! (excuse my language). The Granmula lotion goes on after cleansing and although they say to use a cotton pad, I just use my hands to pat it on. At RM800 a bottle I cannot afford to let a single drop go to waste! You follow up with the Granmula Emulsion and then Granmula Cream. Now in Japanese skincare they double-moisturise i.e. they apply an emulsion and then a cream. If you have oily skin, you can get by with just the Emulsion. I used both at night, but only the Emulsion in the day. They are both very lightweight. I tried these products about a month ago, when my skin was feeling dry, rough and dull after too much travel, air-conditioning and late nights. For the 3 weeks I was using this range of skincare, my skin felt moist and satin smooth to the touch, and it also looked markedly smoother with minimised pores. I experienced no breakouts and things were hunky dory. I had a spot of flaky dry skin on my chin area and this cream cleared it up in 2 days. I let my friend try the remaining sample of the Granmula cream for a few days… and I could not get it back 😛 Apparently it was that good for them too. Sigh. If you are familiar with the Kanebo Impress skincare range, you will be familiar with the “adhesive application method” where you basically roll, not pat, on your skincare by rolling the product with your palms on your skin. You do the same thing with Granmula and I find that it helps it penetrate better and more quickly into the skin. The scent is nice and relaxing, smells a little of green tea and spring flowers, and I’m told specially formulated for Granmula. But I had to get myself back down to earth at some point or another, because I know I can’t afford to maintain this skincare regime. 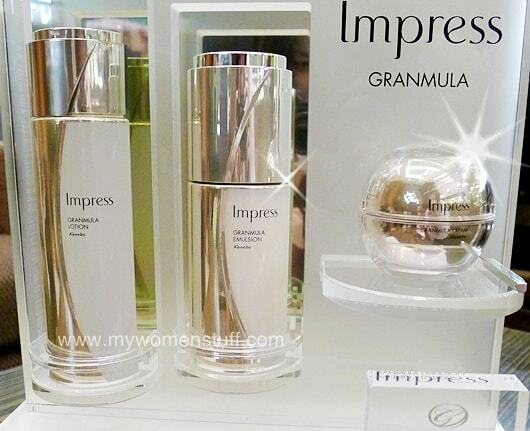 The Granmula Emulsion retails at RM1,200/100ml and the Granmula Cream RM4,600/40g. 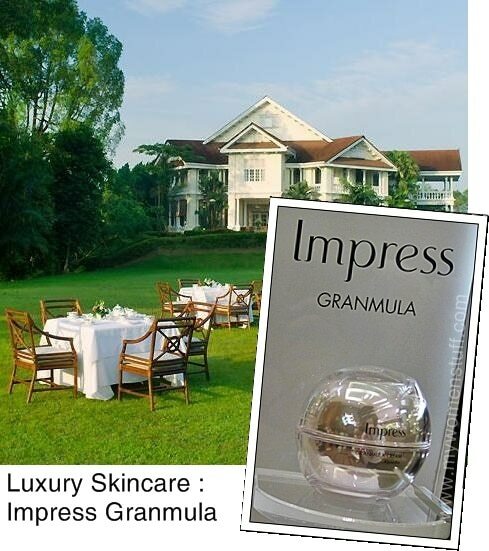 I’ll say that the Impress Granmula skincare range is definitely one for those with very deep pockets. The rest of us will have to be content with the regular Impress or Impress IC range, which is significantly more affordable (and I personally feel, works well enough for us less moneyed folk). I did ask the girls at the salon if Impress Granmula was well received among their clientele since its launch in end Nov/early Dec, and surprisingly, the answer is yes. The reason, they told me, is because its just a little bit more expensive than the Kanebo Sensai Ex La Creme cream that is also in the 4 digits so those who were replenishing their creams were willing to try this new one. Kanebo Granmula luxury skincare retails at all Kanebo counters and salons and retail at RM800/120ml (Lotion), RM1,200/100ml (Emulsion) and RM4,600/40g (Cream). The Granmula facial is RM688 or they might have package deals if you ask. NEXT POST: Kiehl’s Creme de Corps Light-Weight Body Lotion – a dry skin saviour! I love this rangeee does wonder on me as well… If only money is not an issue…. Okay, so I will have the laser treatment and use this Granmula skincare as a daily regimen. Money is not an issue, right? 😉 James, I am still waiting for my wheatgrass shot!! LMAOOO you crack me up PB!!! It is fun to immerse myself into a fantasy world now and then.. Premium skincare, designer bags and the butler.. It would be a perfect fantasy if my hubby was George Clooney or Pierce Brosnan.. No Donald Trump please. Okay maybe for his million dollars! 😀 Haha Harrison Ford is a bit wrinkly now, but he was sweet as Indiana Jones in Raiders of Lost Arc! I do not have one ideal fantasy bag.. Can I just have lots? I only want bags from Dior, LV and Chanel though.. I am not greedy! 😀 What is your fantasy bag? Yeah HF is on the wrinkly side but still I think its that crooked smile 😉 Erm… Fantasy bag is probably the Kelly/Birkin from Hermes. Not greedy. LOL! As for the fantasy bag, I’ll go with any LV Speedy. i wonder if i could just spend the money on 1 tub, makes my skin perfect, then i can stop using it? or i gotta use it on a regular basis? Regular use is probably best but perhaps if you use it to get your skin nice, then continue with the regular Impress skincare line, it could help with the maintenance? I’m not sure 😛 The thing is this. 1 tub can last you 6 months easily 😉 So if you are planning to give it a go (I think you get a set of facials free) then let me know how it fares! 😉 My skin didn’t go crazy when I stopped using it but then I only had it for about 3 weeks. I like your Con….. only abnormal folks can afford this! Whoa…… 4k.. i dun mind using bedak sejuk as whatever-granula emulsion-cream- but for that bunch of money i can already own a Dior panarea!! even got balance of a few bucks where i can continue on its makeup :p owh how i wish…..
LOL! I would spend the money on a bag too 🙂 But for now I’ve got nothing I really want (thank goodness!) so maybe that money can go towards the Granmula cream LOL! mmm…. scones! Warm scones with clotted cream and fresh strawberry jam. mmm….. Ooh so yours is the Gucci Jackie O Ostrich! Nice! 😉 I had the Jackie O but found it too hard to get into and out of, and the metal clasp would squeak if it moved about while I left it undone. Irritated me to death. But it looks darned good when carried. Good choice Reese! *back* Pockets are deep alright, deep with receipts…hahahaha! Christ! That’s freaking expensive! But I guess high-end skincare really is that expensive. Thank God I’m still young and I do not need anti-aging products so I can spend my hard-earned money on something else.^^ But hey, once I win the lotto I will surely buy one of these… for each one of my friends! I bought some while in Japan airport, I wanted to treat myself to some nice skincare products. Not totally familiar with yen, I thought I was handing over a lot of my big notes. Totally freaked out when I was on the plane and did the curreny exchange. Talk about liquid gold. Havn’t told my husband!!! !